50 MMS September 2017 mmsonline.com SHOP TALK delivery of goods and services. The CMI campus includes a 100,000-square- foot facility with a metrology lab, prototyping lab, pneumatics/hydraulics lab and additive manu- facturing area. Students take courses in industrial automation, robotics, CNC machining, manufac- turing management, metrology/quality manage- ment, process design and Lean Six Sigma, among others. Renishaw has committed a four-person staff to the program as well as a host of the com- pany's equipment. Students are learning par t measurement on the Equator gaging system, calibrating machines with the QC20-W wireless ballbar, and setting up machines with an assort- ment of Renishaw probes and styli. Renishaw has also placed one of its AM400 additive manufac- turing systems at CMI. "The CMI program at Greenville Tech, presented as part of an educational partnership with Clem- son University, provides a direct path to employ- ment, and employers get the benefit of highly s k i l l e d e m p l o y e e s ," says Scotty Nicholson, machine tool instructor, CMI. "Students earn a t wo -ye a r de gre e a nd are t ypically funneled directly into manufactur- ing jobs where the aver- age salar y is currently $63,936 for associates- degree holders in Green- ville County." The company consid- ers this a pilot program for similar partnerships a c r o s s t h e U n i t e d States. 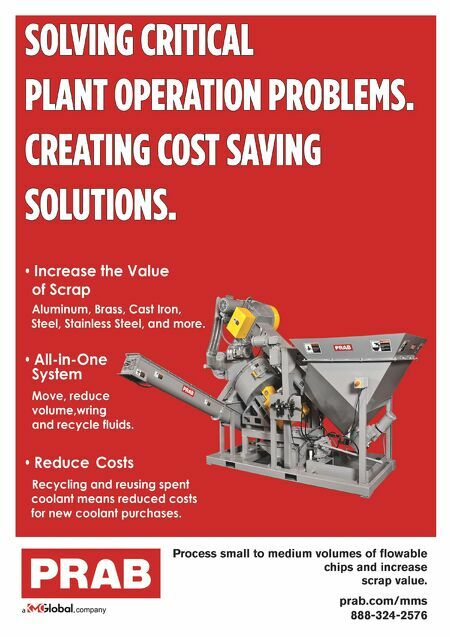 Renishaw Inc., call 847-286-9953 or visit renishaw.com. MITSUBISHI ELECTRIC AUTOMATION NOW OFFERS 24/7 TECHNICAL SUPPORT Mitsubishi Electric Auto- mation Inc. (Vernon Hills, Illinois) has extended its service hours to provide c u s to m e r s w i th 24/ 7 technical support. These extended hours will be At SMW Autoblok, we go beyond the chuck. 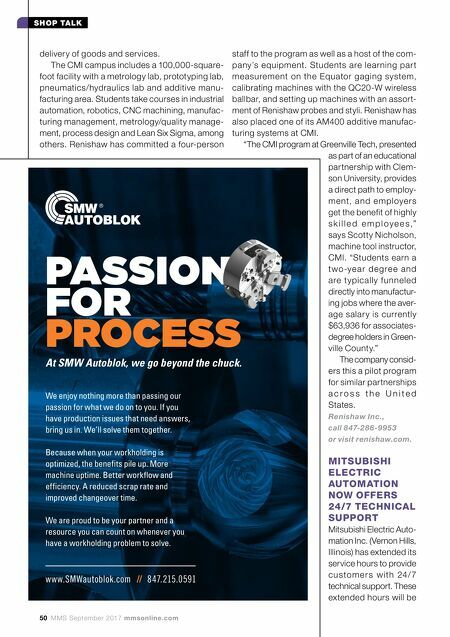 PASSION FOR PROCESS www.SMWautoblok.com // 847.215.0591 We enjoy nothing more than passing our passion for what we do on to you. If you have production issues that need answers, bring us in. We'll solve them together. Because when your workholding is optimized, the benefits pile up. More machine uptime. Better workflow and efficiency. A reduced scrap rate and improved changeover time. We are proud to be your partner and a resource you can count on whenever you have a workholding problem to solve.